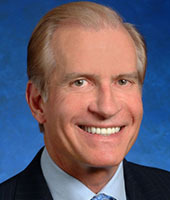 Mr. Woody L. Hunt is Executive Chairman of the Board of Directors of Hunt Companies, Inc. (www.huntcompanies.com), and its affiliated companies. Founded in 1947, Hunt Companies, Inc. (Hunt) is today a holding company that invests and operates in businesses focused in the real estate and infrastructure markets. The activities of Hunt’s affiliates and investees include investment management, mortgage banking, direct lending, loan servicing, asset management, property management, development, construction, consulting and advisory. The platforms employ over 6,000 people. In addition to his duties with Hunt, Mr. Hunt is a member of the Board of Directors for Complete College America; foundation trustee of the College for all Texans Foundation; member of the Board of Visitors of the University of Texas MD Anderson Cancer Center-Houston; chairman of the Borderplex Alliance in El Paso; previously served as Chairman of the Texas Business Leadership Council, where he now serves on the Executive Committee; co-chair and PAC chair for Texas Aspires (formerly Texas Institute for Education Reform and Texans for Education Reform); a member of the Board of Directors for El Paso Electric (Nasdaq: EE); and is a member of the Executive Council of No Labels. Mr. Hunt was previously Chairman of the Texas Higher Education Strategic Planning Committee, which was charged with developing the Higher Education Plan for the State of Texas for 2015 to 2030; Vice Chairman of The University of Texas System Board of Regents; served seven years, three as Chairman, on the Board of Directors of The University of Texas Investment Management Company (UTIMCO); was founding chairman and a board member of the Medical Centers of the Americas Foundation in El Paso; was chairman of the Texas Select Commission on Higher Education and Global Competitiveness; a member of the Western Governors University (WGU) Texas Advisory Board; was a member of the Commission for College Ready Texas and the Texas Tax Reform Commission; was a member of the National Board of the Fund for the Improvement of Postsecondary Education (FIPSE); was a member of the Texas Advisory Committee on Higher Education Cost Efficiencies; was a member of the Task Force on Higher Education Incentive Funding; was a member of the Council for Continuous Improvement and Innovation in Texas Higher Education; was a member of the Paso del Norte Foundation; and was the chairman of the Paso del Norte Health Foundation. He was a member of the Board of Directors and chairman of the Finance Committee of PNM Resources (NYSE: PNM) in Albuquerque, New Mexico; and has served on numerous other civic, non-profit, and professional boards. Mr. Hunt has received the Distinguished Alumnus Award from the University of Texas at Austin, been inducted into the Texas Business Hall of Fame, McCombs School of Business Hall of Fame, and the El Paso Business Hall of Fame, and received the Mirabeau B. Lamar Medal. Mr. Hunt also serves as Chairman of the Hunt Family Foundation, a private family foundation he and his wife Gayle, established in 1987.